You can enhance your beauty by applying a skin-care recipe using freshly ground coffee beans. It benefits skin because it is full of antioxidants. Beauty masks containing coffee lighten and brighten your skin, clear under-eye circles, fade dark spots, tighten the skin, unclog the pores, and revitalize skin cells. In addition, it is particularly useful for exfoliating the skin and getting rid of cellulite. In fact, most cellulite home treatments include coffee. Moreover, it is used in various beauty products, especially eye creams to eliminate wrinkles, fine lines and dark circles. Plus, it helps cure acne and eczema by neutralizing toxic free radicals. Coffee works as a natural astringent and UVA/UVB protector as well. It also has the same pH as that of skin, that is, around 4.5. • Mix half a cup each of brown sugar, coffee grinds and a quarter cup of extra-virgin olive oil. Scrub your skin with this exfoliating recipe and then rinse it off after 15-20 minutes to maintain flawless skin. Use this recipe about once or twice in a week. • To get rid of cellulite, take half a cup of coffee grounds, mix two tablespoons of olive oil, heat the mixture in a microwave for about 10 seconds, and apply it on the affected area. Wrap it with a plastic wrap, leave for 20 minutes and then rinse it off. Follow this treatment about two to three times in a week for a couple of months. • You can make another nourishing coffee scrub by mixing half a cup of cane sugar, two-third tablespoon of vanilla extract/oil, one-third tablespoon of sweet almond oil, and a dash of cinnamon in a bowl containing two cups of coffee grounds. • Coffee works as a good dehydrator and hence assists in eliminating under-eye puffiness. So, you can prepare a mask for tired eyes by mixing together three tablespoons of clay powder, two tablespoons of ground coffee, one tablespoon of organic honey, and a quarter teaspoon each of aloe vera and vitamin E oil. It helps reduce dark circles as well. • Combination of coffee and clay can also be used to remove cellulite by absorbing fatty deposits. For this, you need to add two cups of English clay powder, half a cup of brewed coffee (cooled), a quarter cup of aloe vera juice, and about 25 drops of gingko biloba tincture in a bowl containing six cups of dead sea mud. Apply this dark, thick, and creamy paste generously on your skin and massage it gently. Leave it for almost half an hour and finally wash it off with lukewarm water. Here’s a video showing how to make a DIY coffee body scrub with coffee, sugar, and olive oil. • Coffee berries have powerful antioxidants that help reduce hair fall. Thus, you can brew coffee by putting ground coffee in hot water, apply this solution on your hair when it cools and then rinse it off. This solution makes your hair soft and shiny, too. • Fade dark spots, blemishes, and acne scars by regularly massaging your skin with a combination of coffee powder and baby oil. • Make a natural anti-aging mask for revitalizing your skin and reducing wrinkles by blending coffee grounds and plum fruit together in a blender. Applying a mixture of avocado and coffee helps heal acne. 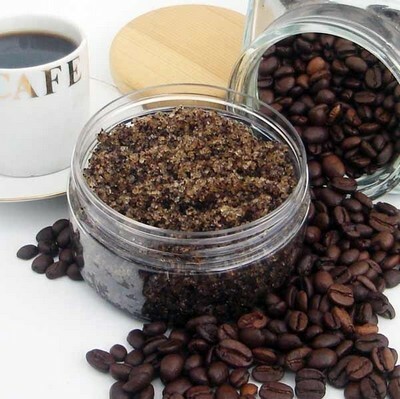 Another anti-acne scrub can be prepared by combining used coffee grounds with a tablespoon of dead sea salt and three to four tablespoons of whole cream. Follow this natural cure once a week. • When dealing with normal skin, you can make a coffee mask by adding egg white in a quarter cup of coffee powder. • Take two tablespoons of white or brown sugar, one tablespoon each of ground coffee, lemon juice, and a pinch of salt. Mix these ingredients together to get a thick paste which can be used as an exfoliating body scrub, particularly for oily skin. • You can prepare a convenient facial scrub to lighten and brighten your skin by adding milk in finely ground coffee to get a thick paste. Similarly, you can make a simple body scrub by blending half pound each of ground coffee, grated carrots, and two tablespoons of cornmeal. • You can prepare a homemade body lotion by melting a mixture of half a cup each of cocoa butter, emulsifying wax and olive oil in a microwave or double boiler. Transfer it in a bottle or jar and mix one and a half cup of hot coffee in while the mixture is still warm. • Another incredibly easy way of using coffee as an exfoliant is to take two handfuls of coffee grounds, add two tablespoons of your favorite lotion and rub it on your hands and feet. I never knew that coffee scrubs are so useful.